Then after you’re done here, you can learn even more about content marketing at our two day Festival of Marketing event in November. We’re all selfish, especially in our business lives. We want to accomplish our tasks, push projects forward and drive growth. When we start planning content with sales goals or product features at the centre of the process, we create promotions and product guides. We tell customers what we want them to know without thinking about what it means to them. If we start with the needs of our customers, their interests and problems, their opportunities and hopes, we create content that helps them as it drives sales, sharing and a deeper ongoing relationship. Think about the purpose and goals of your content. Consider what content you want to publish, for whom, where, when, how and why. Ask yourself who your intended target audience is – who do you want to engage, for whom does the content deliver its value? Our Best Practice Guide on Implementing Content Strategy can guide you through these stages. Consider the purpose of each piece of content and where the content will fit into a purchase or customer lifecycle. Transitional content enables a transition along the sales funnel. Transactional content persuades and enables prospects to complete a transaction. Relationship-building content builds trust, respect and loyalty in ways that transcend individual transactions. Look for gaps on search engine result pages (SERPs) to identify valuable search positions that you do not currently own. Identify the type of content you should produce to raise your search rankings. Review the keywords used by your audiences, the volume of searches for a particular term and how these can be improved. Take a look at your competitors to see how they are performing and where you need to improve. Use Google’s Keyword Tool, your analytics and other tools for analysis. Without governance, strategy is merely a good intention. Follow best practice guidelines around standards relating to the creation, curation and distribution of content within a content schedule. Consider how different content types can be distributed in different formats on different platforms to achieve different goals. 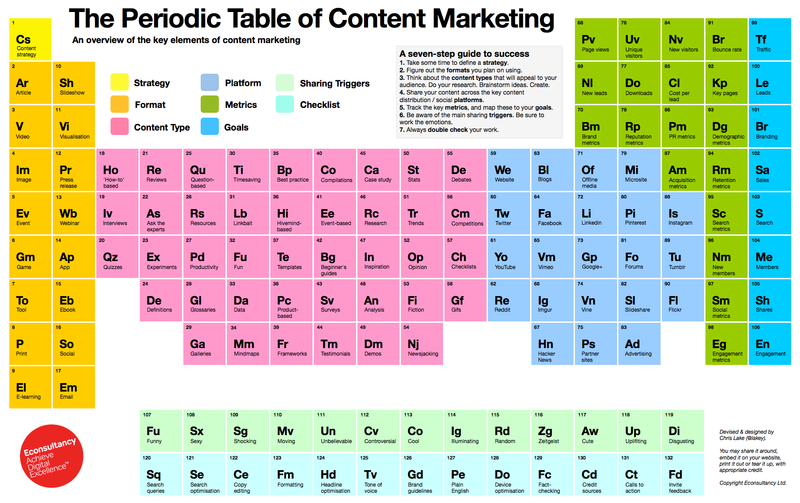 See our Periodic Table of Content Marketing for guidance. Digital places emphasis on being able to respond in a timely manner. Identify opportunities where it is appropriate to put content out there, and then objectively and progressively adapt it over time. Consider the 70:20:10 rule which translates to spending. 70% of your effort on the low-risk, bread-and-butter, tried-and-tested content. Optimise it, amplify it and refine it, but don’t break any rules with it. 20% of your time innovating off what is known to work and what may engage more deeply with specific audiences, but is still likely to have broad appeal. This content stretches and tests the boundaries that constrain the 70%. 10% spent on brand new high-risk ideas that, if successful, could become tomorrow’s 20% or 70%. 100+ Practical Content Marketing Tips: A how-to guide for editors, writers and content creators which presents the lessons we’ve learned from 10 years of writing for this blog. Implementing Content Strategy – Digital Best Practice report, written by Dr Mike Baxter, which provides a framework for evaluating your current content strategy and content planning processes, helping you make the most of your content in the future. What is HTTP/2 and how will it affect your website? When we visit a website, most of us don’t think too much about what’s going on behind the scenes, about the various requests and responses that have to be transmitted and received in order to turn a click on a link into a finished page. However, for a while at least, it’s something we’ll have to pay a bit more attention to, because it’s changing.